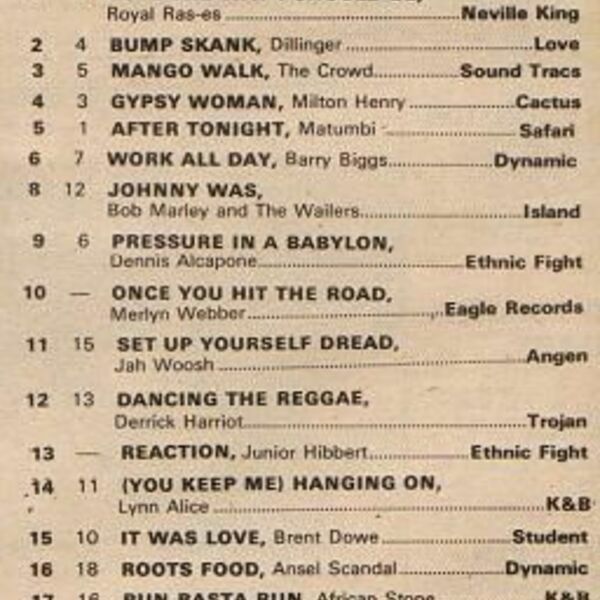 Radio Reggae Charts - 1976 The days when music was sweeter than honey,when singers could sing and even the deejays could rhyme.The songs used to carry a message,a lesson and stories about life,the highs and lows,the twists and turns,the tricks and traps and of sad times as well as of hope and of happy and happier times. Well,that was until the social engineers department threw an entire tool set into the works.Can't fault them for trying but I know just like the late Lucky Dube said "No one can stop Reggae",Reggae is making it's way back to the top....with a vengeance. A new breed of soldier is rising,clean and heartical artists,soon the world will dance and learn again.